Today is May 17, 2012, and it's time for the weekly Grace at Home party! But first, I want to tell you why today is so special in my home. 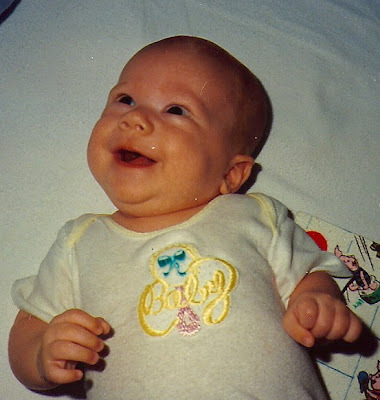 My eldest son, Will, was born on this day back in 1991. Today is his 21st birthday! Will is a joy and a delight, a man of God who is a blessing to all who know him--most particularly to his mom. I'm so blessed to be the mom of three wonderful boys. It's an amazing privilege to watch them grow into adulthood. And this one from just a few weeks ago. And I'll say it once more: the years go by really fast! If I were to give one piece of advice to a new parent, it would be to make your family a place where grace reigns--grace for your kids and grace for yourself. Be grateful for God's grace and model yourself after Him! Whatever you do to make your home a place of grace, I'd like to hear about it. Please link up the permalink for your post, not your blog's home page. Please include a link back to the party and visit with some of the other links. If you can help me spread the word about the party, I'd surely appreciate it. And since today is such a special day for me, could I ask a favor? Could you please take the time to visit the link just before yours? It's not really a party if no one visits with others. Thank you! Happy 21st anniversary of the day you became a mom, Richella! Thank you, Becky! I can't believe 21 years have gone by. How on earth did THAT happen?? Happy birthday to Will. I know how you feel. My middle son will be 21 in September. What? Oh wow! 21! How is that possible when you look like you are only 25? :-) Happy Birthday to Will and thanks so much for hosting us Richella! It's hard for me to even believe you have a 21 year old but birthday wishes to him and to you. It's such a special time as your children grow and you see them becoming adults. What an exciting day for you and Will! That was my boy name if I was to have a boy....:) And he is such a handsome man! Happy Birthday to both of you! Happy birthday to your handsome son! I hope you have a great time celebrating his special day. What a handsome boy/man! Isn't it a shock when your son needs to shave? It was for me-all three times. Your son is so handsome! And you are right, time does fly by quickly! !